Gulland has harboured this enthusiasm since childhood but it only manifested after his checkered chartered accountancy career. Looking back, after he left his accountancy career and was searching for “something new and interesting” outside of the finance space, the design of buildings piqued his interest. This resulted in him getting a qualification from a college in Dorset and immediately taking on the role of a designer at the Countryside Commission for Scotland. He worked on developing low-cost lodging for the country’s long-distance footpaths such as on the West Highland Way. Projects like these inspired his career in the camping sector. “I came up with a sustainable wooden building made of timber, which we very quickly started calling a wigwam and that was the first camping pod anywhere at all,” he recalls. And with this, in 1992, he launched his first construction and design company: All Round Buildings. Around that time, Gulland started working with a business coach who helped him truly understand what his company must be centred on. “It made me really think why I was in business and took me on a journey back to my childhood and that’s where the core purpose came from,” he remembers. 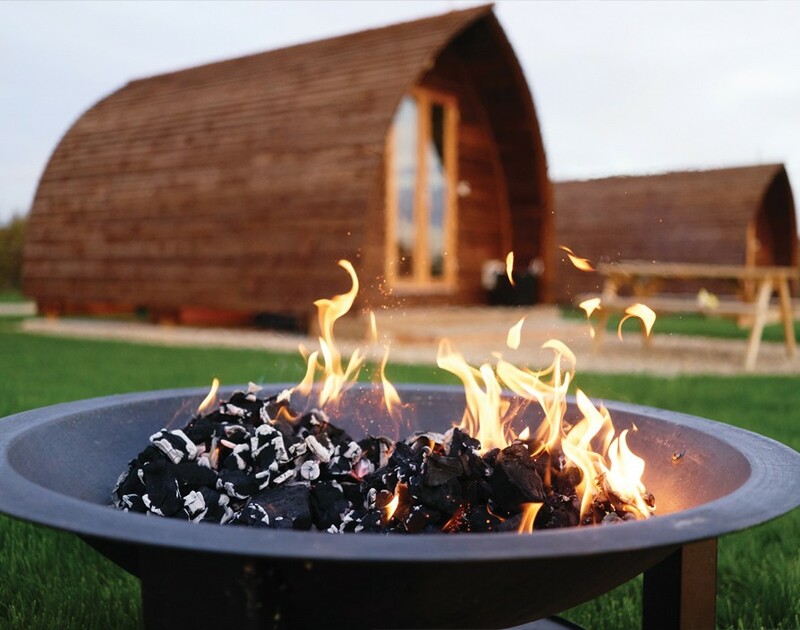 “And it was the belief – which I still have – that it’s really important to get outside, light a fire, look at the stars, get the wind blowing through your hair and switch off technology.” This indeed was the seed which grew over time and eventually led to Wigwam Holidays’ launch in 2000. “That’s when I realised that we weren’t just a building company but actually also a holiday company,” he declares. Seemingly, a disruptive idea comes with its own set of challenges. But that didn’t stop him from pursuing his ambition. “With me – there was no easy money, no fast start,” Gulland says. To get the company off the ground, the main ingredient he needed was cash. Having won £2,000 through a national Westminster award during the initial days coupled with bank loans later, he funded his enterprise. However, Gulland’s aim was to see Wigwam Holidays become a household name for travellers. And that’s when he recognised the power of franchising. For his franchisees, he looked for farmers who owned land and sold his brand to increase his company’s footprint without having to invest additional money. “[Franchising] is all about getting the right people,” he adds. “If there’s one business which is a people’s business – it’s a franchise. If you’ve got a brand that you believe in passionately and if you understand partnership, want a win-win business relationship, then franchising is the best route forward.” Consequentially, he started franchising in 2013. But it isn’t a cakewalk to become a part of Wigwam Holidays. Gulland is strict when it comes to recruiting future franchisees. Just owning land doesn’t suffice. “We find people that share our core values and it’s gotta be more to it than ‘I want to make a quick buck,’” he says. While having the perfect location which fulfils the geographical need is important, the franchisor also expects commitment from them. “It’s gotta be ‘I get this company, I get the core values and I want to be part of this company,’” he adds. However, while it may be a challenge to be accepted into the network, successful candidates enjoy an extensive support and training programme. And after a potential franchisee signs the dotted line, Gulland goes the extra mile in all aspects. “We have invested in a comprehensive brand manual and developed a solid digital marketing plan,” he says. Apart from setting up a website and the social media accounts for the franchisees, his franchise development team is responsible for handholding them in all aspects from the signage, uniforms, literature and proper implementation of the operations manuals. “There’s an element of training around the operations manual so everybody understands what’s involved from the beginning,” he adds. The franchisor doesn’t stop there to lend support for his franchisees but also helps them with funding. In fact, his efforts resulted in his franchisees securing a total of £2m worth of leader funding from the European grant for rural businesses. His business acumen and experience gathered through more than two decades can be clearly seen as the franchisor already boasts of more than 25 franchisee sites which stretch as far south as Cornwall to as far north as the Scottish Highlands. He has 16 more in the pipeline. In fact, 2020 might even see the brand go international. The BYOD dilemma: do personal smartphones have a place at work?